Roman's Taxi in GTA IV, with Niko and Roman Bellic as occupants. Roman's Taxi is the taxi used by Roman Bellic's taxi company in Grand Theft Auto IV. Roman's taxis are solely driven by Roman and his employees (including Niko in some early missions). Roman's Taxi is an Albany Esperanto - due to the Albany badging, many people thought that it was actually called the Albany (which was probably its beta name, see Trivia). The car is visually distinguishable from the Esperanto by its minor alterations—red or yellow taxi emergency lights affixed to the front and back, taxi registration number on the trunk, advertising on the rear bumper and rear window, and a custom red interior. By default, Roman's Taxi is dark gray with a discolored gray driver's side front fender. It can be resprayed to other colors (including grey or red), and may be randomly resprayed back to its default appearance. Performance and handling-wise, Roman's Taxi is heavier than the Esperanto (1700 kg to the Esperanto's 1600 kg), and has inferior acceleration, but has a significantly greater top speed (145 km/h - 90 mph to the Esperanto's 130 km/h - 81 mph); it also has slightly stronger braking and softer suspension. It is slightly less prone to deformation than the Esperanto, and can better withstand collisions. Niko can call Roman to send a taxi to pick him up, after gaining his favor. The taxi driver is notoriously short-tempered, with the taxi rides peppered with insults hurled Niko's way for being a freeloader. After unlocking the Algonquin Safehouse (at which point Roman's business appears to have become highly successful), Roman's taxis are replaced by a fleet of gray Cavalcades, with the same disgruntled driver as before. After this, the car is no longer available, unless the player has saved one at a safehouse. The car can be stolen by the player when it arrives after the player calls for one. Some caution is required when using the taxi service. Often, when arriving or dropping Niko off, the driver doesn't care if he runs into parked vehicles. This includes vehicles parked in safehouse parking zones; to avoid damaging the vehicles, or pushing them out of the save spot (a possible issue depending how the taxi is lined up when it comes to pick Niko up), it's recommend that the taxi be summoned away from the parking zone, and the safehouse itself not be chosen as a destination. Also, it is possible for the taxi to drop you off within forbidden areas that will trigger high wanted levels; while the service won't bypass the barriers between islands, it is possible, for example, to be dropped off within the restricted zone at Francis International Airport. Unlike the other taxi there are a few advantages to using Roman's taxi. The ride no matter where or how long, is free of charge. The driver won't leave the car due to a wanted level. It is a good choice for a drive-by, having someone else drive. If you accidentally try to carjack the taxi, the doors will be locked so there is no wanted level for vehicle theft. The police can't arrest you as the doors are locked. Roman's Taxi is the first vehicle that the player drives in Grand Theft Auto IV, and was prominently featured in pre-release materials, with the car initially painted with an all-black body color. It features as part of several early missions, including GTA IV's taxi side-mission. Albany may actually have been the true beta name of this car. First, it had been seen on pre-release pictures a long time before Rockstar Games decided to incorporate vehicle brands to the game. The car is also refered to as the "ALBANY" in "american.gxt", an internal game file. 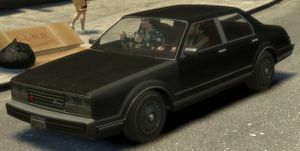 Roman's Taxi as depicted during "The Cousins Bellic", as well as early game trailers, features an all-black body, as opposed to other occasions when the car features a discolored quarter panel. The car also features wheels from a Marbelle, furthering the fact that this was an earlier design of the car, and used in the cutscene. The default radio station in Roman's Taxi is Vladivostok FM. In The Lost and Damned, Roman's Taxi can be called in by dialing 555-2222 (the number given to Johnny by Elizabeta Torres earlier in the game) during the mission Roman's Holiday. Roman's Taxi does not have the same horn sound as the Esperanto. Roman's Taxi features the Door Ajar Chime which can be heard easily in the first mission "The Cousins Bellic". Before moving the vehicle, turn off your engine and get out without closing the door. With a turned up volume, you should hear the chime. Roman's Taxi is still available in GTA IV'S second DLC, The Ballad Of Gay Tony, but it can only be obtained with a trainer. This page was last modified on 25 August 2013, at 14:15.